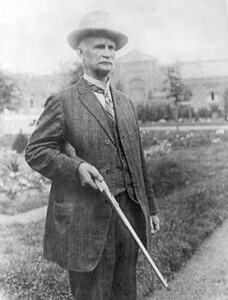 This year marks the 100th anniversary of the 1911 pistol designed by John Browning and originally produced for the U.S. military. The 1911 is wildly popular today, with (at press time) 289 models under production by 25 manufacturers. 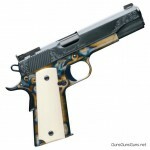 Many of these manufacturers offer centennial-edition 1911s to commemorate the 100th anniversary. The design of these pistols range widely, as do the prices. 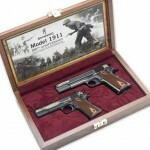 This article provides summary information for each anniversary model currently available, with a link to a page for each gun that features more extensive information and photos. I’ve listed the pistols according to price, from lowest to highest. Note: If I’ve failed to include a model, please let me know via the Contact form at this link, or via the Comment form at the bottom of this article. And if you’d like a closer look at a gun, click on a photo to enlarge it. This entry was posted in 1911 and tagged Handgun Roundups on April 5, 2011 by Jed Henson. SIG SAUER has introduced a line of Traditional 1911s for the 100th anniversary year. Thanks guys! I overlooked that Wilson Combat centennial–I’ll add it now. And I’ll check out those SIGs. Browning has one as well. Thanks Pancho! I wonder who’s building the .45 for Browning? Anybody have any info on that one? Para PXT 100th… Para DID have some issues with the bushings and extractors on SOME of their 1911’s… their customer service was superb… replacing these parts fast and free with EGW stuff… my 100th Anniversary PXT is as fine a shooting pistol as any Ed Brown or Les Baer.